ROBERTS® has taken its environmental responsibilities seriously and has been committed to incorporate sustainability in product design and business practices. ROBERTS continues to minimize the environmental impact of our products by ongoing improvement of product technologies, manufacturing and distribution methods. When you see our Green “e” Logo on a product, you are choosing a product that is environmentally conscious while supporting a company that is committed to protect and sustain our environment. 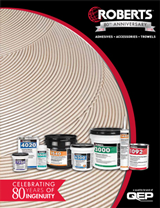 ROBERTS products are designed and formulated with the environment in mind. ROBERTS guiding principles are to promote environmental responsibility in every aspect. 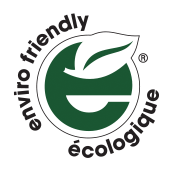 We actively participate with governing agencies and organizations to establish the highest standards for environmentally conscientious products. 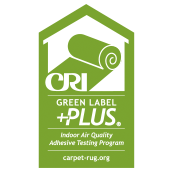 The Carpet and Rug Institute designed the Green Label +Plus program to help architects, builders, specifiers and facility managers identify products with very low emissions of Volatile Organic Compounds (VOCs). Green Label and Green Label Plus ensure that customers are purchasing the lowest emitting carpet, adhesive and cushion products on the market. The CRI Green Label +Plus Logo indicates our adhesive has been tested and meets the most stringent criteria for low chemical emission. The U.S. Green Building Council’s LEED® Green Building Program is the preeminent program for the design, construction, maintenance and operations of high-performance green buildings. 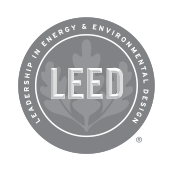 Available for virtually all building, community and home project types, LEED provides a framework to create healthy, highly efficient and cost-saving green buildings. LEED certification is a globally recognized symbol of sustainability achievement. Learn more at usgbc.org/LEED. 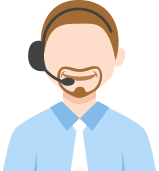 This rating system also complies with the South Coast Air Quality Management District (SCAQMD) Rule 1168. Many of our adhesives contribute one or more points in the LEED rating systems. 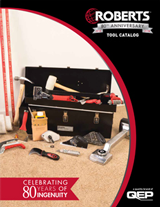 Click here to view our LEED qualified products.